Halloween is almost upon us, and if you haven’t completed your Thanksgiving, Christmas, Hanukkah, and New Year’s marketing plan yet, you’re running out of time. Even if you have a plan, tweak it with this 5-step holiday marketing checklist to see a measurable increase in holiday sales. Your customers don’t have a channel strategy. They have a shopping strategy. And for well over 75% of them, that strategy starts online, whether the final purchase is made in a store or online. So that your holiday sales campaign by looking at how your customers buy. What days of the week are the busiest for your online sales? What time of day, and day of the week bring customers into the store? Are there events – such as a holiday party, Santa’s arrival, or holiday parade – that will bring crowds into your area? What are you going to do to bring them into your shop while they’re nearby? It starts with optimizing your online presence for local search. Local SEO is especially important in reaching mobile customers, since Google and Bing both place more relevance on local search results delivered to mobile devices. The basics of local SEO are the same as the organic search optimization for your website: keyword research, on-page SEO with optimized Title, Meta, and Heading tags, and content that’s optimized for search engines. The only difference in optimizing for geo-targeted keywords based on your location or areas in which you provide service is to target a small area by using additional keywords that assign a territory to your search results. The good news is that there is usually a lot less competition, so you should see results raster. Make sure your locations (city name) are included in your Title and Meta tags. Incorporate local search terms into your content as often as possible without making content sound forced or awkward. If you don’t already have one, get a local phone number. Toll-free numbers are great, but the search engines look for a local phone number with an area code that matches your targeted area, so include the local number on your site. Last year’s data is a treasure trove when it comes to planning this year’s holiday marketing efforts. But too many companies rely on fallible human memories instead of actually delving into the details. That’s why so many companies repeat tactics that seemed to work last year, without really analyzing whether they did or not. Traffic and sales data need to be compared. Where did you get the majority of your holiday web traffic? What drove conversions (sales)? Don’t make the mistake of thinking that a certain ad or promotion was the cause of a sales spike because the two happened on the same day. Look at the data to see what else happened. Can you link your sales to an email? To a social media trend or viral video? Or was it paid search, organic traffic – or something that happened outside the digital world, like a neighborhood event, that actually contributed to your sales spike? Consider the lesson learned by a small boutique in the Bishop Arts District of Dallas. The owner thought that a big sales spike was attributed to social media and email marketing, but several campaigns similar to the ones he thought had boosted sales fell flat. So he went back and looked at the sales data more closely. It turned out that most of his sales were of a single product – and that product had been mentioned on “Good Morning America” on the Monday when his sales spiked. His store was the only one in Dallas listed on the manufacturer’s “product locator” page. So it wasn’t his email and social media campaigns that resulted in the traffic and sales spike – it was simply his position on the manufacturer’s product locator page. So he ramped up his relationships with other companies, and asked how to get listed on their product locator pages, too. It’s a time-consuming, but low-cost strategy, that can work for businesses with a very specialized product offering. Actually looking at hard data about past holiday sales is the most essential step in your holiday marketing checklist. Don’t make the mistake of relying on your gut feelings about what worked last year. If it’s your first holiday season, talk to a more experienced business owner, and take advantage of the “shared experience” of any local merchant’s groups or chamber of commerce groups that serve your area. Build out your holiday landing pages as early as possible, so you can test them. Include your holiday email offers in the testing, since holiday offers and sales funnels usually differ slightly from the rest of the year. Instead of waiting 10 days between offers for a drip email campaign, plan ahead for peak traffic times, and schedule your emails to reach your customers at shorter intervals. Consumers are in the mood to buy. Don’t wait so long that you lose them to a competitor whose offer got there first! The sooner you are able to replace or revamp pages that don’t perform well, the better. You want to push the majority of your traffic to the best performing landing pages, using every communications channel available: email, SEO, social media, paid search, advertising, etc. One of the most effective personalized marketing campaigns in recent years was the OfficeMax ElfYourself social media campaign. The site drew 193 million visits, and continues to evolve with new characters, dances, and animated graphics. Louisiana town after it created free, customized temporary tattoos that read, “I saw Santa at Town Center, and I’m on the Nice List!” or “I saw Santa at Town Center, and I don’t care that I’m on the Naughty List”. The tattoos cost just 2 cents each to make, and traffic at the small shopping center exploded after a big-city TV crew filmed a story about dozens of kids who were proudly sporting the “Naughty List” temporary tats. Whatever you do, make it fun for your customers, and they’ll share it on social media and beyond. Don’t forget to get your employees involved, too. Some studies show that there is only about a 5% overlap between employee and company social networks. So don’t forget to feature your employees directly in your marketing efforts, or just encourage them to share the personalized campaign. People like to think that their holiday shopping decisions are based on practical considerations like cost and convenience. But the truth is that people make decisions emotionally before justifying them rationally – especially during the holiday season. So tug on the heart-strings in your holiday campaigns, and then make it easy for your customers and prospects to share the emotion, and you’ll succeed. While it’s hard to predict what will go viral, one critical factor is making it easy to share content that makes people smile. When someone sees your campaign in a shared post from a friend, it means far more than if they saw it as an ad, or in a commercial. The first step in making your content shareable is to add social media icons to emails, and to the content you publish on your blog or website. Single-click sharing is essential to any campaign that goes viral. Last, but hardly least, once you’ve created engaging tweets that are begging to be shared, don’t make the mistake of just sharing them once. Social media icon Guy Kawasaki repeats all of his tweets four times, 8 hours apart. Why? Because that increases the chances that his followers will see them, since no one can see a tweet if they aren’t actually awake and online when it’s “scrollable” on their screen. 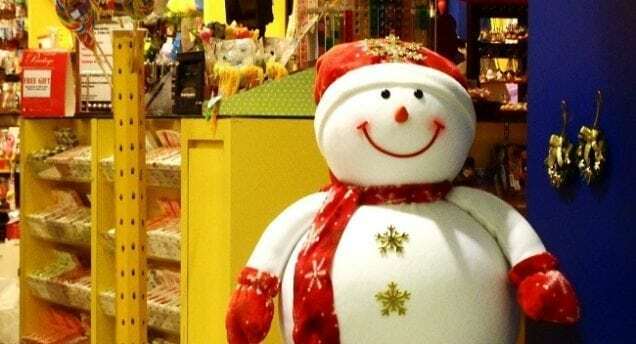 Photo credit: The photo of the snowman retail display by photographer Pat Lim is used under a Creative Commons license from Pixabay.